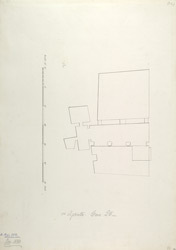 Plan of Cave XXV at Ajanta in Maharashtra from James Burgess' 'Original Drawings from the Buddhist Rock Temples at Ajanta.' The remarkable cave temples at Ajanta are situated in a horse-shoe valley of the Waghora River. The caves contain prayer halls (chaityas), or monasteries (viharas), built for Buddhist communities. The caves were in use for about eight centuries, and can be divided into two groups according to the early Hinayana and later Mahayana phases of Buddhist art. The first group was excavated during the second and first centuries BC. After a period of more than six centuries, the excavations restarted around the fifth century AD, in the Vakataka period. The caves contain some of the finest wall paintings in the history of Indian art; notable both for their technical mastery and wide-ranging subject matter. The later caves contain numerous sculptures, showing the influence of central Indian Gupta traditions. Cave XXV, dating from the late 5th century, is an incomplete vihara cave and is located on the right side of Cave XXVI.